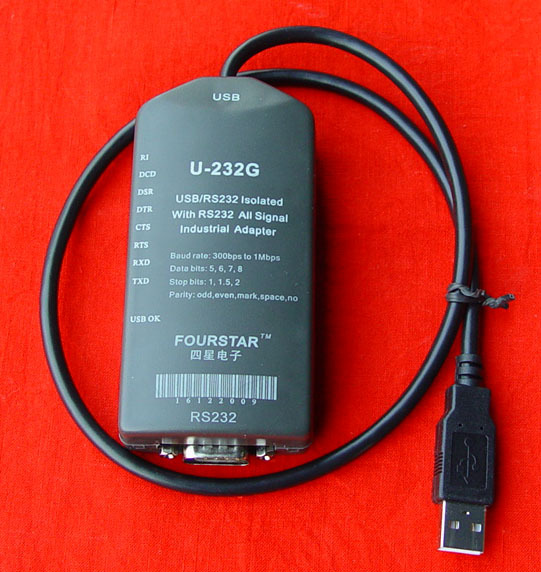 U-232G is a full-line isolator converter used for the transformation from USB interfaces to RS232 interfaces. Controlled by the drivers running on the computer, it emulates the computer’s USB interface to be a traditional RS232 serial port (commonly known as COM port), thus realizing utilization of existing programming software, communication software, monitoring software and some other application software. It obtains the operating power source via the USB interface and therefore needs no external power supply. It has LED indicator lights for all RS232 signals to indicate the operating mode of the interface. U-232G is an industrial-grade product originally designed for industrial application. All RS232 interface signals are subject to photoelectric isolation. An industrial-grade chip with ESD protection is employed. The power circuit has an overcurrent protection circuit. U-232G realizes very perfect emulation of RS232 serial port and is even able to conduct hardware I/O operations directly. With it, it seems that application programmers were visiting a physical RS232 port. U-232G supports a majority of traditional PLC programming cables, which is an essential difference with the similar products on the market. See the Appendix below for the results of tests in which U-232G is connected with various programming cables of traditional RS232 interfaces for communication with PLC. ● Completely compatible with USB V2.0 and USB CDC V1.1 codes. ● RS232 interface and USB interface have ±15kV electrostatic discharge shock protection. ● It is powered on via the USB bus and has an electricity consumption of about 100mA and overcurrent protection. ● Each PC can support 127 pieces of U-232G at most. 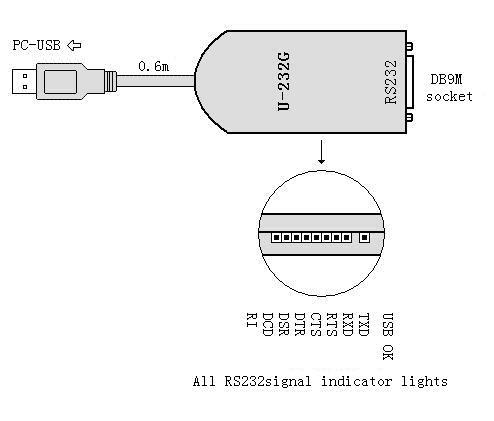 U-232G programming cable can be used only when USB device drivers are installed. The drivers are all on the CD sold with the product. Please see the instructions on the driver CD for the specific installation method. After completion of installation of the drivers, the USB OK indicator light on the isolation converter will light up and a COM port corresponding to U-232G will appear in Device Manager of Windows. It is necessary at this time to select COM port in the application software. The method of use after that is identical with that of traditional RS232 interface. If the drivers have not been installed or not installed successfully, or U-232 fails, the USB OK indicator light will be out.